Bobcat Company has been a long-time client of Video Arts Studios. 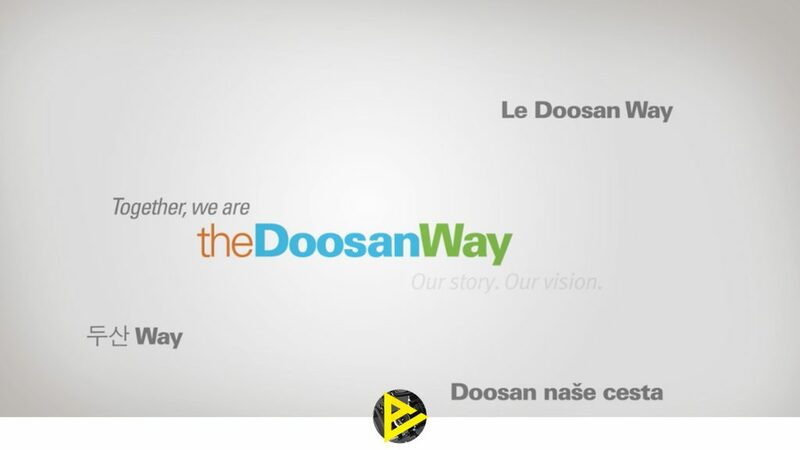 Annually their parent company, Doosan, conducts worldwide celebration events for all employees in 38 countries. Doosan’s reach is as far as South Korea, so when Nikki Bruce, Director of Communications, Global HR, requested help with the celebration video, we were happy to create a visually captivating and upbeat piece. This video was a part of the celebration and by creatively editing the images, Scott Tostenrud took care to show case the thousands of employees from around the world. We are once again proud to help a client celebrate their successes! The audio production and music recording facilities at Video Arts Studios, is at your service for original music and jingle composition and production, as well as post scoring, audio sweetening and musician recording. For both short and long form scripts, clients from across the country utilize Hired Gums, a voice over service with over 30 unique voices. Our studios were designed by world-renowned New York designer, John Storyk. All studios are equipped with digital workstations, and sport a full-compliment of microphones, keyboards and samplers. Regional and national artists as well as corporations have utilized Graffiti Music Studios for recording and original music production. Video Arts Studios is a full service creative communications and production facility with offices and studios in Fargo, North Dakota.